The 'Human' hitmaker - whose real name is Rory Graham - has beaten 'Rockabye' singer Anne-Marie, 25, and pop beauty Dua Lipa, 21, to the prestigious title and was so overwhelmed when he found out that he didn't believe it. Speaking of his win, he said: "I thought they had made a mistake. I was up against two pop giants. It's bloody brilliant! I'm crazy happy. Proper massive grin." The 31-year-old singer-songwriter's win comes after a stellar year for the musician after his hit single 'Human' peaked at number 11 in the UK charts. And the Brighton-born musician is set to release his debut album, of the same name, in February 2017 and is hoping to follow in the footsteps of previous Critics' Choice winners; Adele, Sam Smith, Florence and The Machine, Emeli Sande and last year's winner Jack Garratt. The rising star will be presented with the prestigious award and will perform the hit at the live BRITs Nominations Show on Saturday, January 14, which will be broadcast on ITV. He will be joined by Olly Murs, Craig David, Christine and the Queens and 'Britain's Got Talent' alumni Calum Scott. 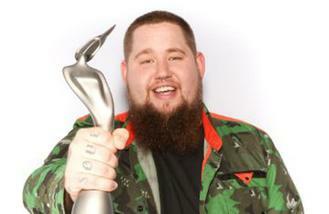 Rag 'n' Bone Man previously revealed his shock of being nominated for the annual prize. He said: "Absolutely bonkers, I've been grafting.